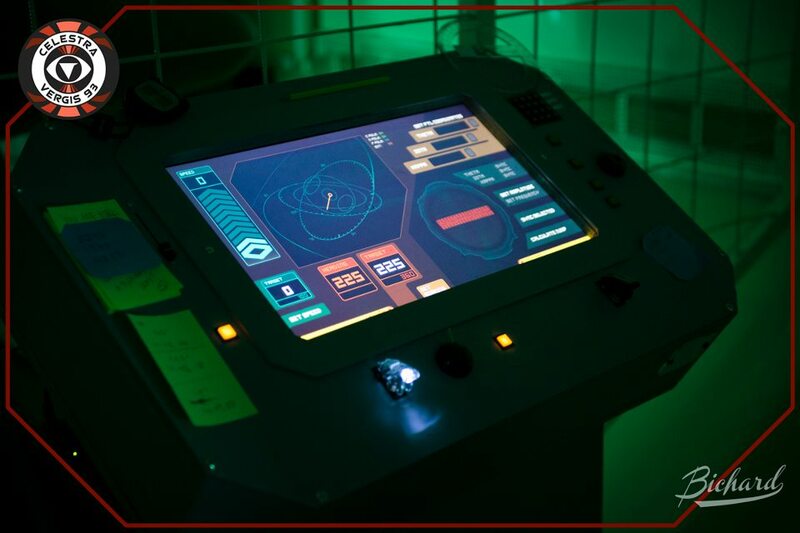 The Monitor Celestra was a Battlestar Galactica inspired non-profit larp project in Nordic style that was held during three weekends in March 2013. 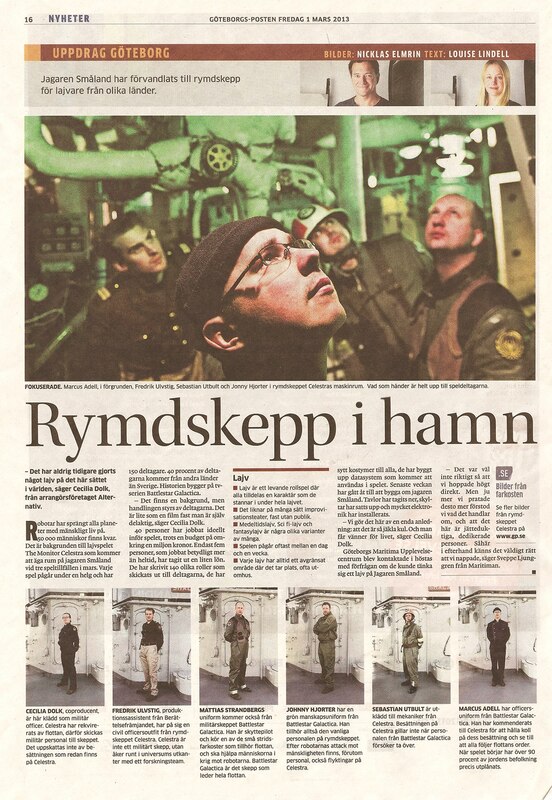 It was an action-packed high drama experience that took the real Swedish destroyer-class ship Småland and turned it into a real frakkin’ spaceship. Carolina Dahlberg and I took part of the third run of the game and here we have summarized our experiences, as well as included thoughts by participants and the organizers. 9/4 – The breakdown of the larp, interviews and links have been added to the article. 25/5 – Sofia Alonzo held a presentation about the game at Geek Girl Meetup Enter Space. 26/5 – There is an ongoing crowdfunding campaign to make organize The Monitor Celestra in US. Check it out here at Celestra 2.0 or here to fund it. It seems that Edvard James Olmos who played the legendary Adama thinks the idea would be cool to do. 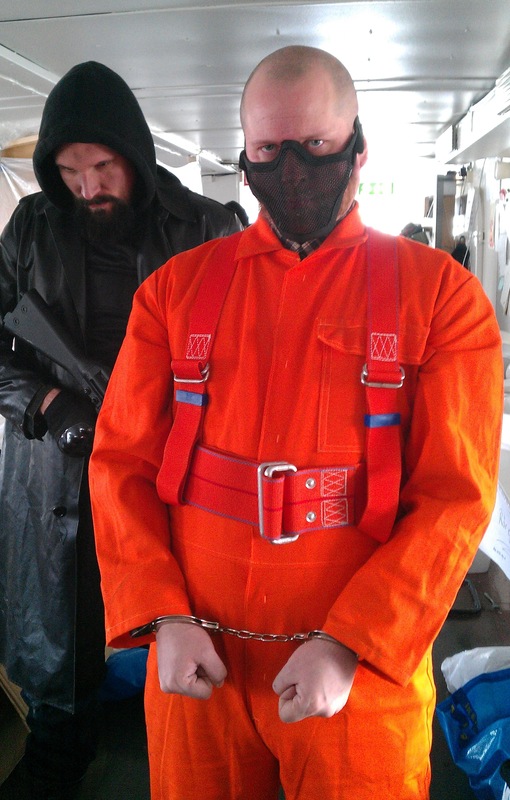 27/5 – New great movie from the larp by Fish and Elephant Production added. Three days ago, the 12 colonies of man were destroyed. Less than 50 thousand souls, a few hundred ships, is all that is left, all alone in the night. This is the story of one of these ships and there is a reason you have never heard it. It’s the story of The Celestra, last of the Monitor-class ships. This is a story you can never watch or read. It’s a story you must live. A larp is a personal experience. Some people had the larp of their life. Some had a good one. Some players left because it was not for them. 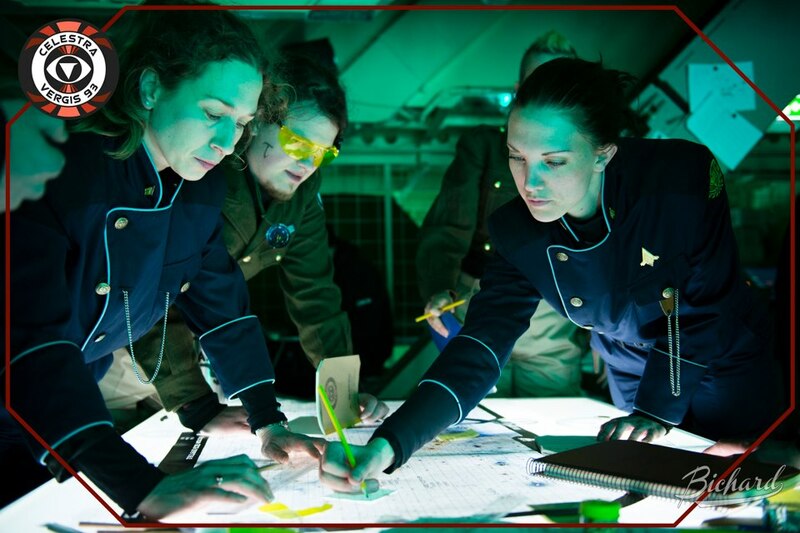 While we cannot speak neither for the earlier two runs of the larp, nor for any of our co-players, we will state that our experience was a great one for most of the time and we are really happy that we enlisted as engineers on the Celestra. To try and capture the experience as engineers in the Life Support Crew of the Celestra, we chose to use video documentation. This was done by reporting during the four acts, in this larp, called episodes, as well as interviewing some of the approximately 140 co-players. 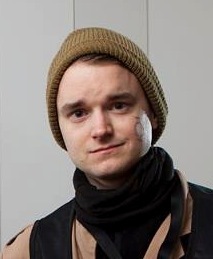 The filming was never done during the episodes and it centered around Petter’s experience as Juha. It also includes some words from the organizers in the end. The Monitor Celestra was captured on film by several camera crews during the different runs. On game three Iain and Peter from Fish and Elephant Production followed the larp, acting as a team from “Caprica News Service”. This was to not disturb the ongoing game and instead add to the experience for all, which I think worked out great. Also the movie really captures the feeling of the Celestra. All the material was shoot in-game. Three days ago, humanity was wiped out by a massive holocaust, initiated by the human-created Cylons – a race of sentient machines. Humanity’s children have returned, and they found their parents wanting. Battlestar Galactica is “naturalistic sci-fi.” It is not high-tech – quite the opposite. The tech is very retro compared to modern standards. Except for the fact that they have space ships. The Monitor Celestra is a technology enhanced science-fiction Nordic Live Action Roleplaying Game about cultural and personal conflict in the shadow of the destruction of the twelve colonies of mankind. It is the spiritual sequel to the legendary game Carolus Rex from 1999. In the larp setting, the Monitor Celestra is an old ship that survived the first Cylon war, 50 years ago. It also made it through the initial Cylon attack four days ago due to its extreme low-tech standards. At the beginning of the game, the ship is with the main fleet and the 50.000 surviving humans. Then the Celestra accidentally jumps to the wrong coordinates, and is lost in space with only a small hope of making it back to the main fleet. The game had around 138 participants (389 in total on all three) and cartered to a wide variety of player styles. Some players focused on exploring every mystery in the narrative, while others were more devoted to being immersed in the strong thematic storyline of the Battlestar Galactica universe. In an early phase people were able to crowdfund the larp. You could choose to just support the project and give it a financial push. But you could also pay quite a lot to the secure a spot for yourself or even your friends and getting a first choice on characters and also specially written story arcs. When signup opened people could sign up for whatever character class they wanted (A, B and C) and the only real difference was the price of the costumes. The ticket cost was from approximately 290 EUR to 405 EUR. All characters were written by the organizers. Due to delays, the majority of players from game 1 received their characters a week before the larp. The rest got them only a few days before the larp. For our game, the characters were sent out about 1 1/2 week before the larp. The ONLY difference between the character classes is the prize of the costumes worn during the game. There is no qualitative difference in the writing or the amount of influence the characters have. Before the larp, we also received a load of information about historical events in the fiction that were relevant for the story of the larp, groups and affiliations, as well as suggestions for how to develop our characters throughout the game. Although the larp was marketed as “pay and play”, which typically means that only very minimal preparations are necessary for participants, it was obvious that we needed to prepare more in order to have a good experience at the Celestra. A typical example was seeking out other players in our group through the web forums, and watching (at least) the pilot episodes of Battlestar Galactica, the reimagined series (TRS) from 2003. The mandatory episodes were few, but it was clear that you could get a lot more out of the larp if you indulged yourself in the universe. Before the larp started, we had a workshop to make sure we could run the ship as the action began in the first episode. Apparently, the players of the first run received little or no training, resulting in a lot of confusion as the game began. Thanks to the workshop, we knew pretty well what to do. That didn’t mean we didn’t face huge amounts of confusion and stress as the damage control screen flashed “TOXIC LEAK IN FORE CORRIDOR” for the first time! Although the panels that was used in the game intentionally were said to be the backup system that the characters also should have limited knowledge about, it is still important to feel comfortable as players with your tasks in the game. We also had a briefing about the playing style to get everyone more or less on the same level. Different players had different workshops, depending on the tasks their characters need to perform on board. This led to quite a lot of waiting for other players. We feel that if the workshop day had been planned in a more efficient way, the organizers could have found room for more group meetings and workshops about cultural differences between the different factions, for instance. It should also be added that the venue lacked good rooms suitable for workshops and the options that was planned to be used was lost in a late stage. The game began with the specially composed intro music playing. The civilians and the Celestra crew were at their starting positions. We were by the damage control console, holding hands as the intro music started and then slowly started to play, tentatively, as we weren’t really sure what would happen. During this episode, the Battlestar Galactica’s marines, engineers and officers did a friendly takeover of the Celestra and their Major Darlington took the command. About halfway into the episode it turned hectic and we need to jump several times with the faster than light engine (FTL) to be able to escape the attacking Cylon raiders. 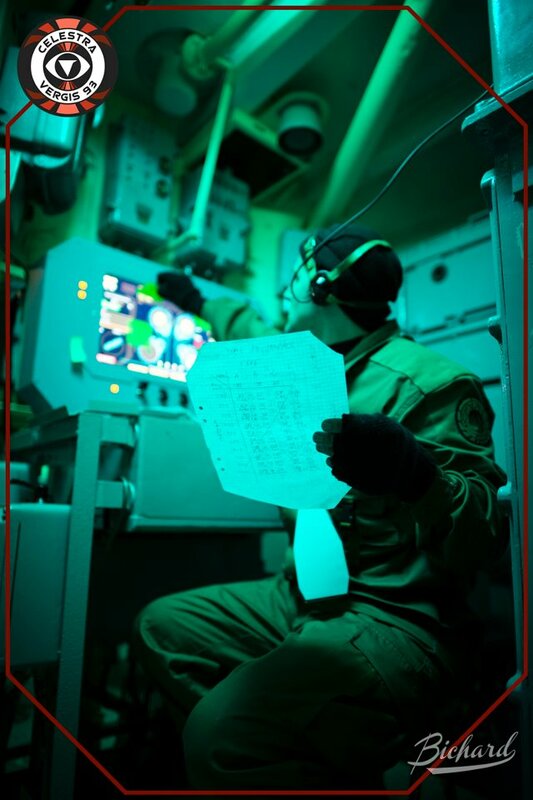 At the end of Episode 1 we found out that we had managed to jump to the wrong coordinates, and that we couldn’t return to the main fleet. (Frakk!). Then the specially written music score was played once more, as an outro to mark the end of the episode. The first episode was designed, as a writer in the production crew put it, “as a tutorial” for the players. The game masters offered a decent challenge, players-vs-environment problems to be solved, but nothing we couldn’t handle with our brief experience of the Celestra’s hard systems and navigation controls. For us, the episode was about establishing the starting relationships in our group, getting to know each other and our characters in play. We ended shortly before midnight, confused but happy, and went to bed almost immediately when we got back to the hostel since we could not sleep on the ship. Day two had roughly 15 hours of play. It was insanely intense. The starting position for the second episode was a tribunal about who was to blame for the erroneous last jump that pushed us away from the main fleet. The episode featured a major strike among the Celestra engineers as well as a fight to regain civilian control over the ship. The main themes were about democratic rights and worker rights. The dominating Tauron population (80%) also had a mourning ritual to send their dead friends and family on their way to the Fields of Elysium, ending the mourning period and opening the option of clan-feuds once again. The Tauron clan play wasn’t very prominent, but the four different clans offered a chance of finding allies on all levels of the ship’s commanding hierarchy. Episode 2 ended with the military once again taking control by declaring martial law. After this announcement, the outro music started and we went out for a sandwich and a break. The third episode started roughly at 16:00. Our instructions here were to start in a state of open conflict as the Galactica crew were forcefully taking over control of the ship. It went quite well, and as the episode continued, the control over the ship shifted several times. Play became more chaotic at times as many fractions stepped into the fight: the criminal network Ha’La’Tha, the political representatives, the worker union leaders, the Celestra command, the clan leaders… and many more. It was a mess. No one knew what was going on, really, but we had fun in our little corner of the storyline, even if it was just a small one. 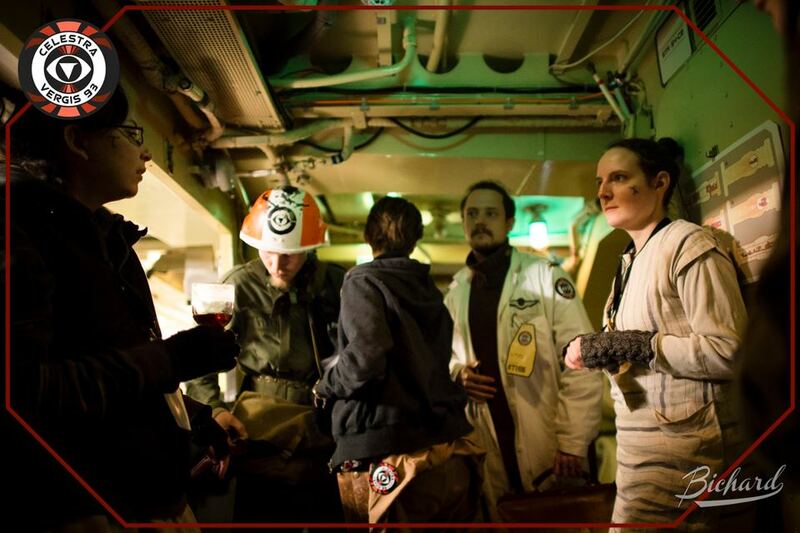 At the end of the episode, we had a major accident in the engine room – improvised by the engineer players and not initiated by the game masters – resulting in a lot of injuries and one of the engineers almost dying from radiation injuries. That turned the severity up a notch, as we had been instructed that Episode 3 would mean a lot more consequences from our actions. At one other instance, one player decided to turn on the radiation alarm in order to create panic – resulting in many people being affected by radiation in-game although it wasn’t a “real” radiation alarm. Several of these confusing moments could probably have been avoided by clearer instructions before game start. 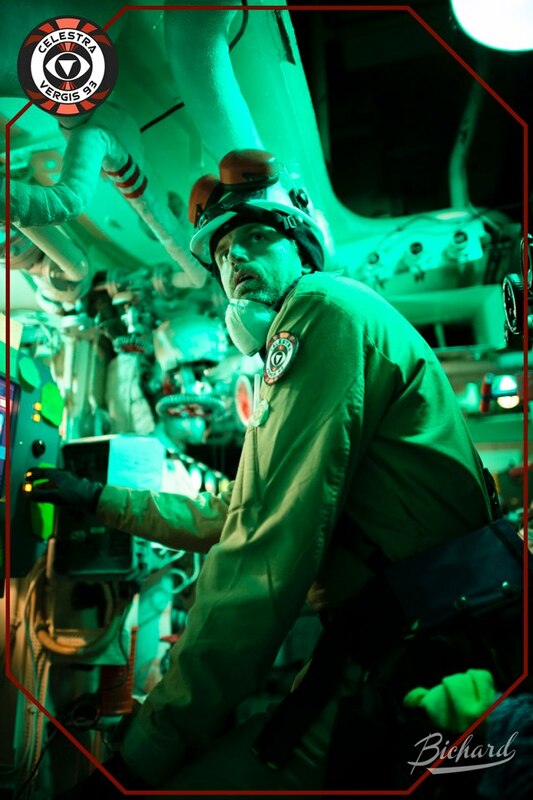 Episode 4 started with a major shootout in the civilian and crew areas of the ship, and it continued in pretty much the same manner as everyone played their characters’ conflicts to the bitter end. At the end of the episode, 40 characters had been airlocked, shot or committed suicide. During Episode 3, a cut in the leg was a serious aggression, while in Episode 4, people were openly executed at gunpoint. For a lot of players, this drastic turn of events helped their game a lot, offering an opening to create drastic plot turns and changing their character’s behavior in a desirable manner. For others, it was a game breaker. The instructions were also interpreted very differently by different players: Some thought of Episode 4 as an action episode, where cool violence, executions and shootouts was the main focus. Others simply interpreted the instructions as an excessively clear way of explaining that it was okay to kill characters now if it fitted well into the story. At the end of the episode, the ship was simmering with either conflict or the aftermath. Some were just waiting for the game to end since most of their co-players’ characters were dead, others were still in the middle of play. It’s hard to tell post-game what was going on during Episode 4, since there were a zillion plot lines competing for undivided attention from the players. The game master (quite abruptly) ended the game around 15:30 with a loudspeaker speech, audible throughout the entire ship, about witch-hunting and real historical references to the (we assume) Cylon-human-conflict. A few moments later, the outro music played. For some players, this ending was perfect since it fit well with the story they had experienced during the larp. Others thought their Celestra experience didn’t at all parallel with any historical witch-hunting, making the end speech a strange and unfitting end to their experience. After the game ended and we gathered outside on the jetty, the game master told us that the larp ended with the Celestra nuking a Cylon research facility out of space, and deciding to settle on a habitable planet. This was one of many potential outcomes of the story. From what we’ve heard, all three games ended very differently. We weren’t really aware of all that was going on during the game, other than small bits and pieces. Still, it was nice to hear the story conclusion afterwards even if it didn’t change our experience during the game itself. We didn’t have a debrief despite the fact that the organizers had talked about pairing us up with a debrief buddy after the game. Instead, we were instructed to get back to the hostel, take pictures if we wanted to, check out and get ready for the afterparty. We both missed a proper debrief after the game, especially since Petter had to leave quite soon for his train to Stockholm. Much later, during the after party at Bishops Arms, the music of the pub suddenly faded, and the Celestra thematic music started to play instead. The whole evening was a parade of thank-you-s and hugging. The larp gave the players complete freedom to decide the Celestra’s fate. The story had several potential endings, depending on player choices. The game had a lot of “hard systems” that determined navigation, weapons, damage control, radiation etc. and created real consequences for people onboard the Celestra. Phones placed around the ship to let players at different stations communicate and make in-game public announcements. 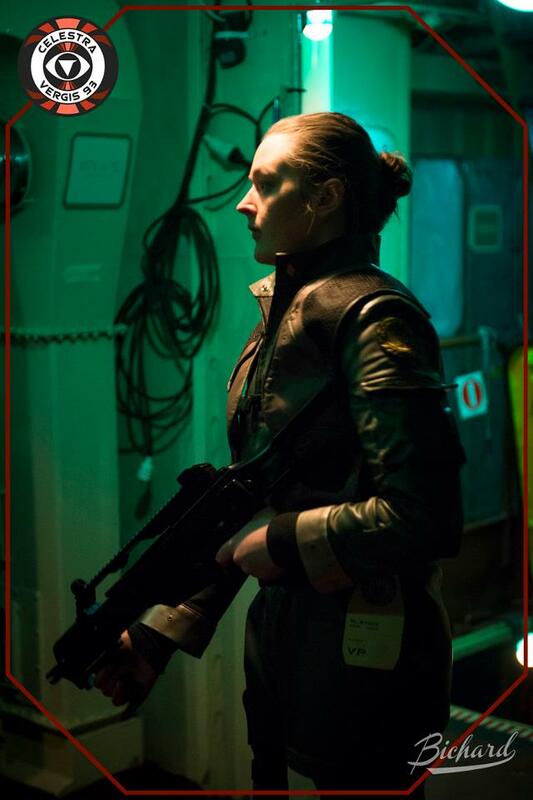 And many more things… a lot of it worked very well and the heavy and extremely ambitious tech support for the larp added a lot to the immersion and realism of the sci-fi setting. Everything a player does at a station has a potential consequence for the game. We want to give players the freedom to steer and manage The Celestra as they see fit, prioritizing the scant resources available to have her perform as they will it. This means we are putting major effort into creating interfaces and systems with the look and feel of a Galactica computer system. As well as surround-sound, atmospheric effects, mechanical interfaces, custom keyboards, pyrotechnics and fun systems to make you feel like you really are controlling an antiquated spaceship in an unexplored part of space. To help out with technical issues and general uncertainty and confusion regarding the ship and space travel, the game masters resided in what in-game was a small monitoring ship called Orpheus, following the Monitor Celestra everywhere in space, but never interfering with command’s orders. We had a phone number with which we could reach Orpheus at any time during play. They helped us with practical information and problem solving, restarting consoles and clearing shuttle docking and space travel. The Orpheus game masters interacted with us through recognizable in-game characters, making it easy to relate to Orpheus as diegetic content, and not an out-of-game practical necessity. This was an elegant solution to what could have become and awkward out-of-game issue, but became a fun and playable in-game issue. Episode 1. Get into character. Find out what works. Learn to run the ship. Episode 2. Pursue your main storyline. Form relationships. Episode 3. Tension starts to build up. Conflicts become more tense and all injuries sustained are more severe. Episode 4. People will die in this episode. All players are encouraged to escalate conflicts into killing. We as players were also at several times called “the cast of the Monitor Celestra”. There was a clear start and end of all the episodes. 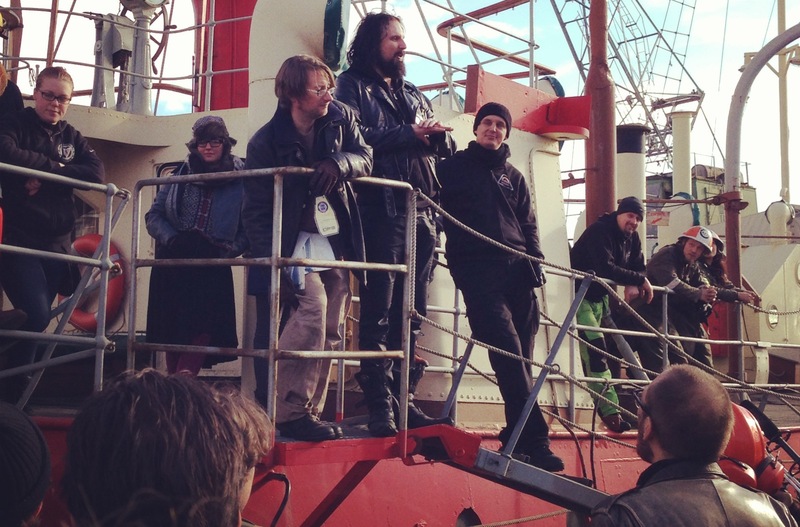 The loudspeakers in the ship played a song that was composed for the larp. Sometimes this also was combined with text being read as in the end of the larp. Inspired by the psycho-drama between characters Gaius Baltar and Caprica Six in the Battlestar Galactica re-imagined series, the larp had a number of phantom players. This feature was inspired by a dramaturgical game mechanic called Shadows that has been used in other variants on several different larp before. The phantom players were playing real characters in game, but were invisible unless they initiated player contact by touching a player during the game. Not all players were phantom play ‘targets’ during The Monitor Celestra, but anyone who wanted help with their character’s motivation or otherwise get input from the vast game meta-plot could get it. To do this participants could ask the Phantom players in between episodes to offer a scene or two in order to let their character ‘see’ the red clad figures who seemed invisible for everyone else. 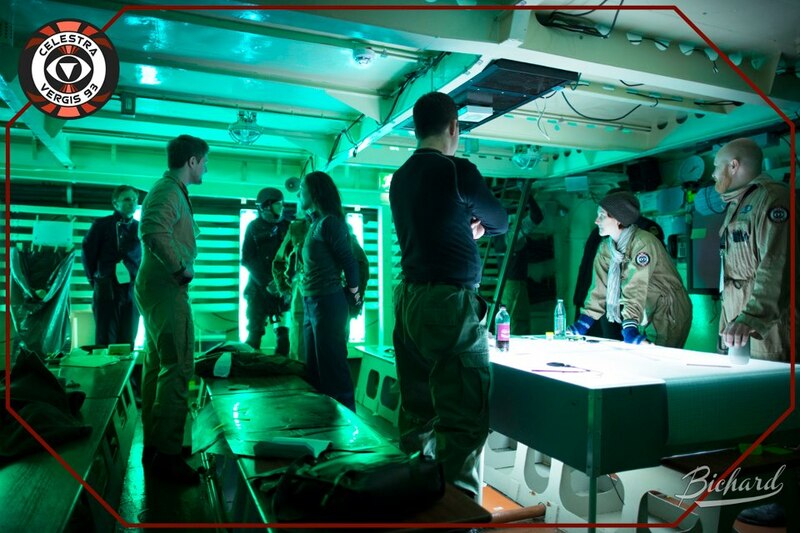 The Phantoms was a nice initiative that seemed to have worked very well during the larp and it brilliantly added to a “Battlestar Galactica”-experience. On a side note from Carolina: It was also nice to play up those affected by phantom play, to make them feel like they were crazy, talking to themselves or pressing themselves up against a wall for no reason at all. On a side note from Petter: Getting affected by phantom play was awesome. Is nobody else seeing that person in red? Why isn’t anyone listening? Did I do the right thing when I cleared my lover for active Viper duty? Did that guy see me cheating the draw to get off Tauron? Is that my dead daughter? Am I going crazy? Through use of specially instructed players we will make it possible for you to experience Cylon projections and more mundane flashbacks that make up core parts of Galactica storytelling. We take inspiration from the Baltar – Caprica Six relationship and strive to make similar dilemmas available to all players, directly or indirectly. One of the story components of the Monitor Celestra was the Vergis Corporation – the owners of the ship. In the area known as the Vergis Tower, there was a holoband room. This room was specifically used for meta scenes known as projections. In-game this meant using the holoband technology featured in the Caprica spin off series in the Battlestar Galactica universe. This feature was inspired by the dramaturgical game-mechanic black box scene play, but integrated in a diegetic manner. After this, a meta scene plays out where the scientist players now act as the characters present in the holoband experience. In this way, players could play previous events of their character’s history without breaking the in-game chronological context. Apparently, this mechanic also worked out very well during the game. You might suddenly find yourself back in your Tauron house, living out dilemmas of your past that continue to haunt your character. All within a specially designed Room of Projections. To be able to play out some scenes such as flying Vipers spacecraft outside the ship and boarding another ship different methods were used. 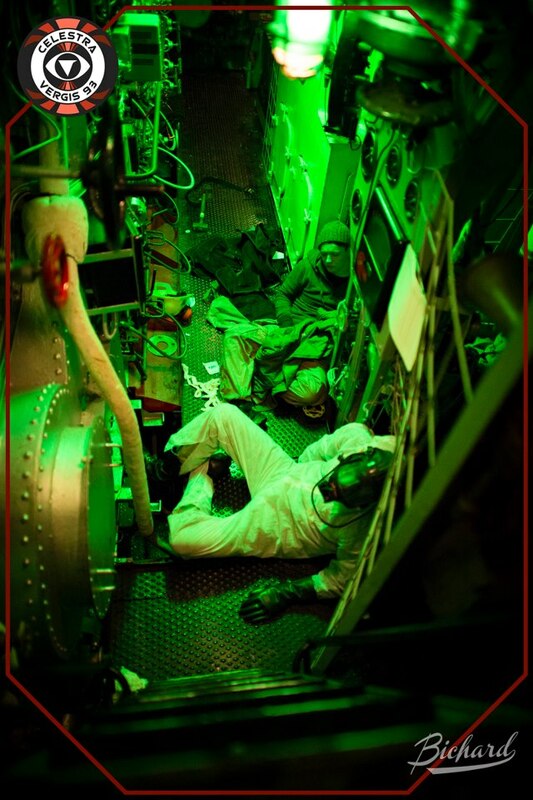 Some scenes were played in a nearby submarine in 360 WYSIWYG-style. Other were played out more in freeform tabletop style. This also seems to have been worked out great. If someone picks up a knife, that person now “controls” the scene and other players will, in the end, allow the person with the knife to get what he/she wants. If a second gun appears, that gun trumps the first one. The knives/guns rule was easy to remember and seemed to have worked out quite well. However, there were a LOT of guns and maybe the rule would have added more, and killed less, drama if there had been fewer. A feature that worked quite well was the instruction of playing to lose. This method takes the larp more to a playing style towards narrativism where building the drama is more important than winning every scene. This is quite common approach in the Nordic larp scene but it was clearly stated and it seemed to work well. The game was organized by a core group of experienced individuals and many hard-working volunteers, under the label of Alternaliv AB and with the assistance of Bardo AB and Berättelsefrämjandet. 1) Why did you partake in organizing The Monitor Celestra? 2) What has been the most rewarding experiences with making a frakkin’ spaceship fly? 3) Martin Ericsson told the players before one game that the organizers had constructed a magnificent sandbox for them to play around in We (me and Henrik Summanen, my partner from Alternaliv AB) created a similar sandbox for the rest of the organizer team to enable them to “play” around and be creative in. It then took a lot of effort to coordinate but I think it worked out! Head of production sound, and overall planning. 1) I had come to a time in life where this project sounded reasonable, and above all it was very fun to organize larps again, after 15 years or so. 2) Leadership in nonprofit projects is always hard and very rewarding. In this case everybody worked their asses off just to make a good production. That is rewarding. 3) I think a better connection between story/fiction on the one hand, and tech/production/costumes etc on the other would have been a more awesome experience. Next time. Co-producer working with logistical aspects and budget among and other areas. 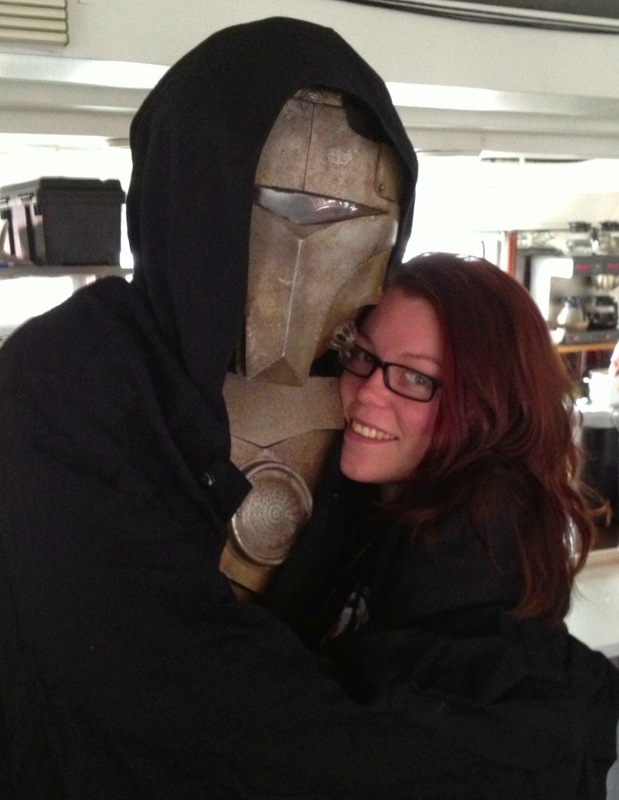 Cecilia with the Cylon Caliban. 1) I did promise Martin Ericsson that if he did something like Carolus Rex again I would be a part of the production, this was at the after party for Skymningsland 2010. When he called me and talked about Celestra I just realized what a crazy production it would be and suddenly I was a part of it. 2) To see peoples faces when they enter the Celestra for the first time, to experience a whole new type of game area and also to be able to be a part of three similar but so different versions of the same space-story. It’s hard to pinpoint stuff, I think of different things each day. But what comes to my mind, is all the happy people with their smiles! 3) So many thoughts right now, I’m just in my bleed and feel so humble for being a part of this amazing frakking crazy event! Producer of Fiction, Also playing Daniel, model no. 7 in Game 3. Daniel Krauklis as the Cylon model no. 7 and to his left creative director Martin Ericsson. 1) I was a functionary on Carolus Rex, felt like organizing again after a long pause, was asked to come to the first visionary meeting and was attracted by the mix of people in the team. 2) Planning and delivering 140 really well-written characters, directing the game masters on games 1 and 2, and most importantly – hearing players who had a great experience tell their stories. 3) It was a big adventure and a LOT of hard work but we didn’t really do anything new with Celestra (and didn’t intend to, either), except when it comes to scale. And production time. Not until the contract with Maritiman was finalized, sometime mid- to late October, did the work start. Going from nothing to full larp in four and a half months seems exceptional even to me, and can explain both what we succeeded with, and things we failed to do. 1) I joined up for two main reasons; the crew and the boundary-smashing plan. I knew most of the organizers from earlier projects, and we all knew that this was it, this was a great chance to show what some of the most experienced larp makers in Sweden can do. Secondly, the plan. Something as large and complex as The Celestra hadn’t been attempted in Sweden in a long, long time – maybe never. I knew I wanted to make sure the parts I could improve and work on would be as frakking good as they can be. 2) The most rewarding experience is seeing the shellshocked players 60 seconds after leaving the boat. Apart from that – the camaraderie behind the scenes, and seeing the players taking our sandbox and making beautiful art of it. 3) The term “pay-and-play” are henceforth banned from larps, new term is “costume included”. The term sets too many wayward expectations. The boat is awesome. 1) Battlestar Galactica is my favourite TV-series (and I like a lot of TV-series) so I really couldn’t miss the chance of creating something set in its universe. 2) The number one reward: meeting the participants, seeing their faces and hearing their amazing stories after the larp. Seeing how well they fill out the costumes was also rewarding. 3) It’s been really amazing to see so many people and so many visions come to life. This project has from the start been filled with knowledge, drive and some amount of insanity. Elin Gustafsson prepping the phantom player Fredrik Åkerlind. Writer grunt, meta doctor, and game master during game time. 1) Because I was asked, and was flattered. It seemed cool, and I felt that I wanted to contribute and be a small part of it. 2) Seeing the participants creativity and imagination take off, and filling our story, a story that without participants would be nothing but an empty shell. 3) There will be written long texts about this game, why it was great, why it sucked, and so forth. I really look forward to read all these texts. 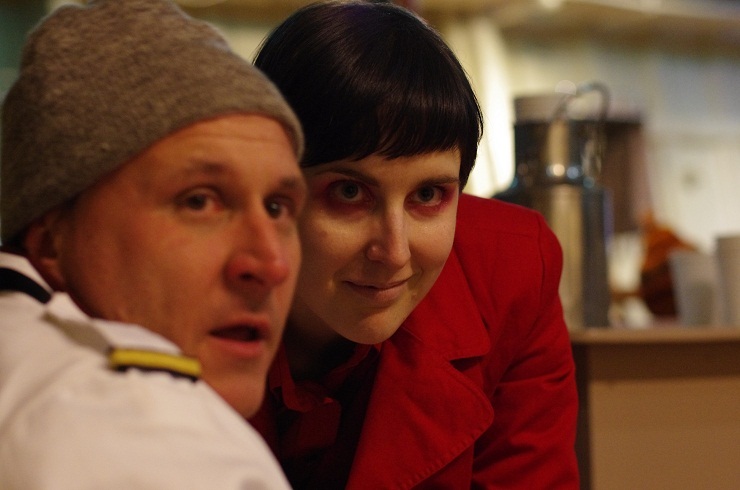 Head of marketing before the larp and one of three onsite responsible during the larps. 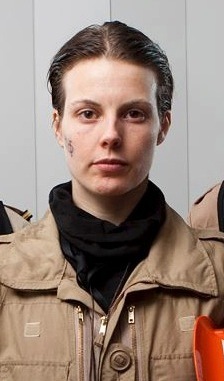 Sofia Alonzo before entering the Celestra as a rebel from a “freedom fleet”. 1) Well, to start with because Cecilia sat on my couch crying because she could not do all her stuff on her own, so I took a few of her things, and that worked so well that I got more and more on my table until I was one of the onsite responsible. 2) Two things, for me. One. seeing that we could do amazing things. so much of this was impossible but we just solved it and made it work anyhow. And two, the people! All the friends I made, both participants and crew there is no way I can describe how much that means to me. They are the best thing ever! 3) Well right now the biggest thought is: It’s over! but yes, it was an great experience, it was a fantastic project that would not have been if not the crew had been so absolutely amazing and quick on their feet. It was so good to see the participants come out and be really immersed in the story and feeling of the Monitor Celestra, that is a feeling of victory. Administrator/coordinator & production assistant handling loads of practical details and various other tasks such as marketing and info. 1) Mainly because i had some time on my hands and it was a really cool project to work with that I could not possibly miss. As time progressed more tasks surfaced that needed to be organized and executed to make this spaceship to fly. 3) We have done it! We have shown (mostly to ourselves) that projects like this can be done. We have taken a mad fantasy and made it real (sort of at least). Not even the sky is a limit, We’ve gone beyond 3 times in 3 weeks. It is really difficult to grasp the magnitude and impact of a project like The Monitor Celestra. 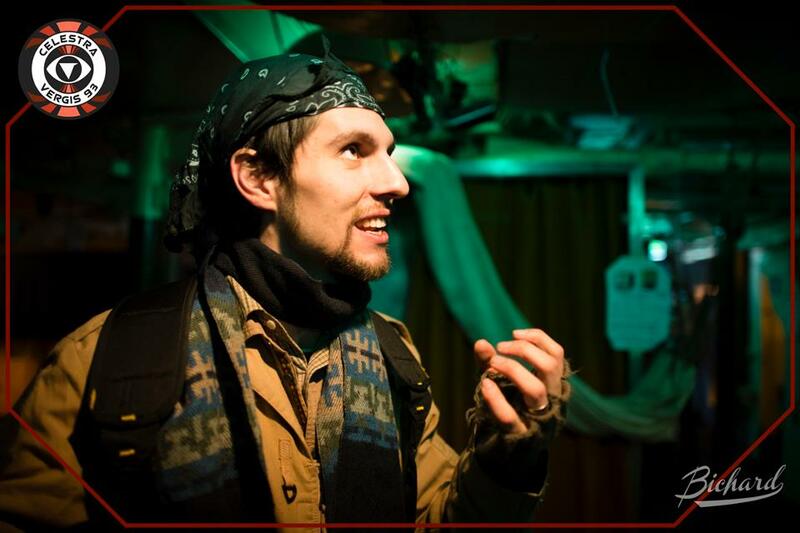 The Monitor Celestra was without a doubt an event that will go down in the history books of Nordic larp, so say we all! 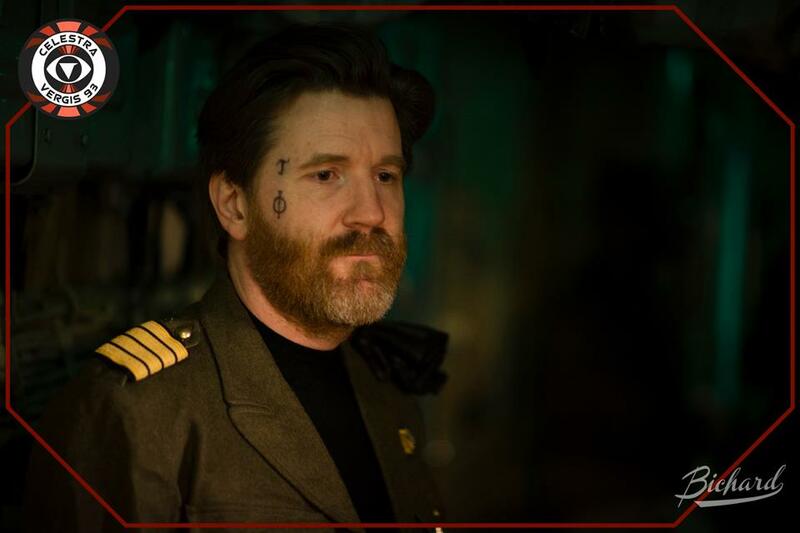 It was the most ambitious game I have attended to in terms of location, visuals, sound design, costume and tech – the sound of the FTL jumps alone was worth the participation fee! And yet, the game left me wanting. Not because of some obvious flaw or mistake, but because the game had so much unexplored potential. In the rhetorics of the workshop the participants were referred to as ‘the cast’; an excellent move to give us the feeling of playing a larp about a tv-series. This could have been further elaborated. Using ‘tv-series’ as a framework in the pre-game info would not only have made the larp avant garde in the area of game design, but would also have made it easier to build coherent story arcs and introduce themes for each episode. As it were, the game ended up quite chaotic – only in retrospect can we tell what the story, and each episode, was all about. Another promising potential from the setting was the tv-series focus on emotion and relationships. This was to a great degree lost in all the mysterious plots and enemy attacks on the ship. Getting an undisturbed moment by the memorial wall (again, fantastic visuals!) to share ones hopelessness with fellow survivors proved to be a great challenge. Guns flashing and torpedoes firing demanded too much attention, leaving little time for complex relationships, deep emotions and cultural play. I write this with the deepest respect for the organizers. In a big production like this there is only so much time and energy to go around, and producing this level of set and props must have taken a lot. It is no surprize that other parts got less focus. I loved the Monitor Celestra, and yet I mourn what it could have become. At first I thought “this is cool, but won’t work.” There was just too much focus on vast meta plot secrets and the milsim-style spaceship simulator. Quite early on I realized that the Monitor Celestra was largely a sandbox larp with a huge amount of secrets to be uncovered, and practically zero transparency. The game design was badly suited for my player style. Where I wanted coherent story arcs and clear instructions, the larp ended up in chaotic situations and individualistic plotting. I ended up dumbstruck by what I perceived as incoherent chaos – too insecure about what to do or expect that I periodically ended up not doing anything at all. Luckily I was able to compensate by preparing a solid personal storyline for myself and those closest to me. The first 3/4 of the game was fantastic, much thanks to the amazingly cool visuals, the awesome ship and great co-players. It was also nice to have a ‘job’ to do as a mechanic in life support crew. I am very, very thankful for this experience. Despite numerous flaws, this larp is a milestone and featured what is probably the best visual and sound experiences in the history of nordic larp. The organizers were incredibly brave to take on this project, and I admire their resolve. Stepping into the spaceship Monitor Celestra really did blow my mind. Looking at everything done with the amazing venue, such a lighting and sound design really made the steel battleship become a steel space battleship. Adding to that is the technology that made everything go around. I have seen tech at larps and the saying is that it always fails. Luckily, we played the third round and it worked almost flawless at our game. However, the tech team really made a crazy effort. The systems looked amazing and the low-tech feeling of buttons was great. Another reason that this was one of the most aesthetically appealing larps I’ve attended was the costumes. The main part of the players paid to get a character with costume which meant that the larp looked amazingly good. The costume team did an amazing job and I’m surprised how badass people can look wearing overalls. So what was lacking? An obvious thing was the information overload. Too much information on to many channels before the game was very annoying. Some important info was hard to find. Some important info was impossible to find. That being said, this was not as bad in our game as in the previous one. But it once again raises the question of the existence of internet forums and how much weight you want to lay on the shoulders of your participants. During the game I did have some downtime and the game didn’t flow as great as it sometimes did. I really think some workshops would have improved the game a lot, especially a workshop that helped us getting into the culture play about the difference between Taurons and Capricans. Then more about the clans and how our different daily traditions and rituals could played out. Now this was left hanging loose and up to the players. Workshops can, if executed in a good way, really make a difference. One thing I learned from producing Just a little Lovin 2012 was to get all the players on the same level of information, rules, playing style as well as deepening characters, groups and relations. If done in a good way, this give the participants less work with reading up and connecting before the larp. Some of the workshops we had on Celestra worked fine and did the job. But with just a little more effort on this, thing could have improved massively. A really bad thing was that there was no debrief. For me and many players this was probably not a problem. But this game was at times really intense and sometimes you really need a debrief to get some stuff out of your system, even it you can’t solve it all then and there. This is something you don’t take out of the planning. However, my Celestra experience was mostly fantastic. I had some great high-tension drama with a load of great players on a mind-blowing spaceship. I am truly amazed by the work put in by the production team and the stories that we all created together. The biggest nordic thing that positively affected my game was probably sharing. 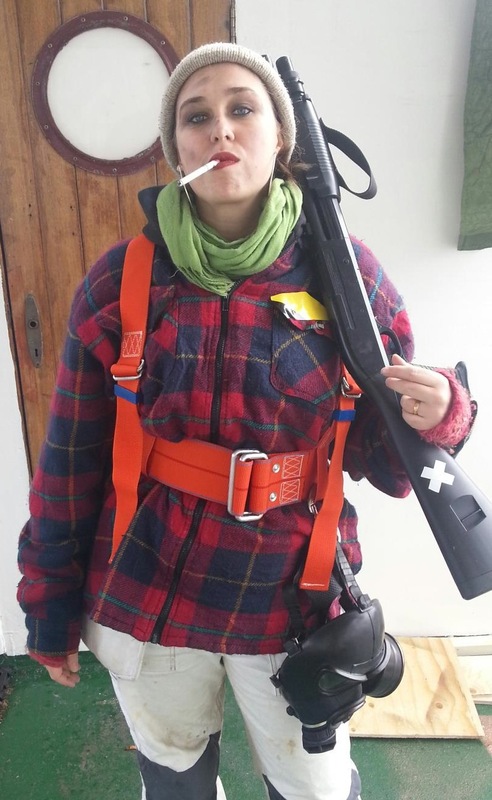 In France and Switzerland, secrecy is a huge part of what makes larping fun. Add to this many people playing to win, or at least looking for the pleasure to discover things by themselves, this can result in information retention. In Celestra however people were so open about their secrets, like the players of the super secret spy squad dropping physical clues just to give more game to people. The biggest revelation to me was the idea of larping. Everyone was committed to creating a great, believable experience even if it meant something bad for your own character. It felt like an extended theatrical improvisation, except it was aimed at us, not at an audience. I saw and experienced deep and moving emotions as participants discovered things about their characters and themselves. I was able to get totally into a character who is very different from myself, taking actions instinctively that were right for him, but I would never do. The crew put in an immense workload in creating costumes for the B and C-class players, as well props for some A-class players. These are some of the costumes that were in play. Taken by Andreas Bruzelius. The following images were taken in game by artist/photographer John-Paul Bichard during the last two episodes of game three. The images are part of a long term series of works that explore constructed identities and roles. In-game photography in larps is tough: the action is usually better live than documented and few players want a camera stuck in their face when immersed in a character. 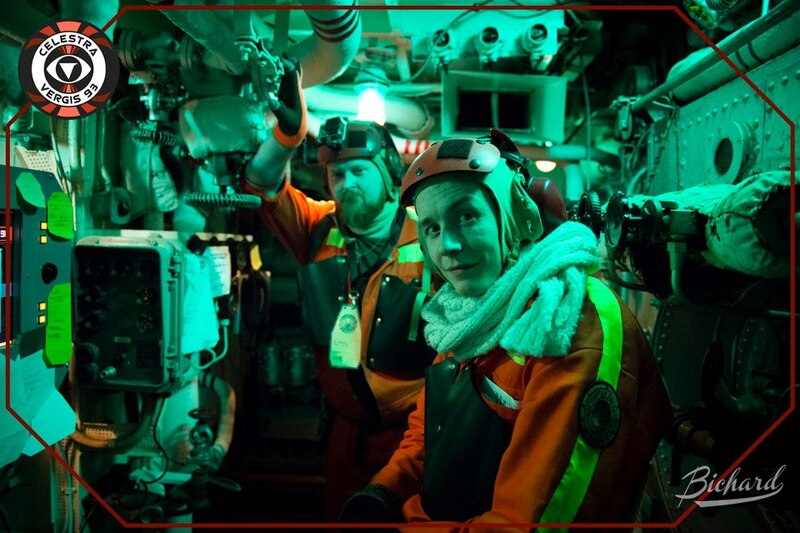 With this in mind and after discussion with the game creators, Bichard assumed the simple and unobtrusive role of structural engineer with a hand lamp and modded camera to record all those ‘interesting structural beams in the ship’. A combination of looking busy, checking and re-checking equipment and shooting from the hip resulted in very few players being aware they were being shot. At times of intense action and high stress, it becomes easier to be more direct as stress narrows the subjects awareness. All the shooting was done manually with occasional autofocus, a lot of adjustment and some really good low light lenses. The rest was experience of shooting in low light and understanding people’s behavior in high stress situations. Several further factors made the task a lot easier: the character and features of the ship, the lighting design and great costumes. The combination of these factors meant a working environment that was both convincing and varied, making the challenge of shooting the unfolding story a unique experience and a thrilling, unforgettable adventure. Snygg video Petter! Gillar verkligen tempot i klippningen. Läckert! Måste fråga, vad är det för musik du använt? Om du vill använda något från Celestras original musik så e det bara att kontakta mig. Musiken är gjord av Kevin MacLeod och med CC-licens. Credit står i slutet av filmen. Dvs. om du inte redan har den. Tack Joel! Hör av mig om jag sätter ihop nåt mer. Pingback: Larp critique: The Monitor Celestra Battlestar Galactica larp | Thomas B.